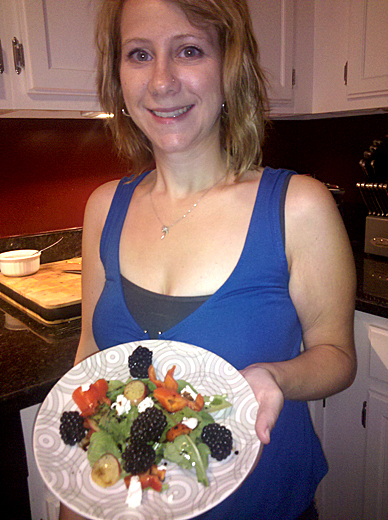 For a refreshing side salad that’s full of flavor and fun, try my husband’s Blackberry & Goat Cheese Salad. You can add this salad to just about any summertime barbeque event or to accompany a basic pasta salad. It’s easy to make and even easier to eat! Rinse all fresh ingredients and pat dry with a clean paper towel. Slice red bell pepper to desired sizes (diced, sliced – the choice is yours!) and slice red grapes. When slicing the grapes, first cut the grapes into two equal parts then place the grape cut size down on cutting board. With one finger on top and your knife parallel to the cutting board, slowly make horizontal slices until the grape has been fully sliced. It’s important to use a sharp knife, but be careful not to slice your fingertips. Place a bed of spinach on a salad plate or bowl. 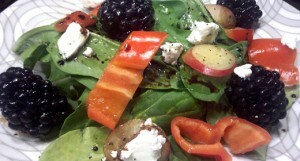 Add sliced (or diced) red bell peppers, grapes and desired amount of blackberries to spinach. Crumble goat cheese and sprinkle on top. Season to desired levels with salt and/or pepper. Drizzle balsamic vinaigrette. Serve and enjoy!